Maybe its high-time you give up on multiple layers of coating where there’s only basic level of protection. Are you ready to put an end to the wear and tear caused on exterior walls due to intense rain ultimately causing the wither of coatings? You could be done with exhaustive number of coatings done to your walls once and for all. Introducing to you, the Excel coating’s EXCEL CoolCoat® – SUMMER HEAT REFLECTIVE COOL ROOF PAINT. 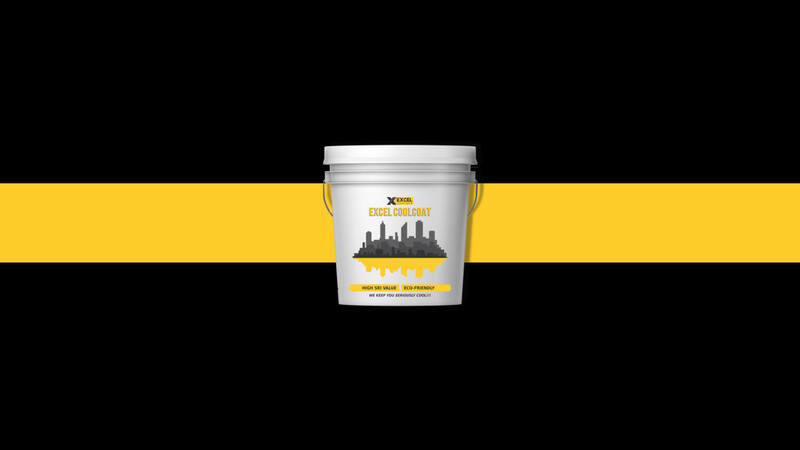 The EXCEL CoolCoat® – SUMMER HEAT REFLECTIVE COOL ROOF PAINT is so distinctively manufactured that it is capable of withstanding various stages of withering due to changes in temperature and weather. With the aid of reflective and nano insulation technology, the product is capable of heat rejection with advanced levels of color stability and outstanding clarity thus offering a stylish reflective appearance like no other. With such excellent level of heat rejection, the temperature within households is maintained at a perfect level thus making normal lifestyle more pleasant. Talking about endurance, the paint is waterproof and repellent to dirt from the surroundings. The paint also makes the color resistant to various types of fading. And finally, the affordability of the paint in terms of application and maintenance makes the EXCEL CoolCoat® – SUMMER HEAT REFLECTIVE COOL ROOF PAINT an obvious choice. Having a history of innovation which define our capabilities to provide low cost solutions for homes and industries, we managed to make our mark as one of the leading companies in the field. Our products which have been awarded with an enormous number of certifications by various reputed trusts are eco-friendly and thus they clearly establish the standards we have set over the past two decades. It’s time we stop making these promises so that you can try them out yourselves to experience a sophisticated standard of living by just changing the external appearance of your homes. Contact us right now!